The blockade is by members of the Ukrainian government and allied militias who are ultranationalist, racist, and have a pathological hatred of Russia and all things Russian. The reality is that Russia is not waging war against Ukraine, as even Ukrainian military leaders have admitted. Approximately 40% of Ukraine’s electric grid runs on coal. The county is already in an energy emergency. Ukraine’s 19 nuclear reactors rely on grid power for cooling. If the grid goes down partially or completely, if there is no back up power, Ukraine could experience up to 6 X Fukushima. The United States has waged a destabilization campaign against Ukraine since the end of World War II, nurturing neo-Nazi elements in the society. Asst. Sec. of State Victoria Nuland admitted the U.S. has spent $5 billion in this effort. The U.S. supported the Maidan coup d’etat in 2014, and continues aiding, arming, training, and advising the military, the militias, and the government in the war it wages against East Ukraine, where a majority of residents are ethnic Russians. Germany, the UK, and France are also responsible for this horrific situation. These countries must stop their financial, military, and moral support for the Kiev regime. The organizers of the trade blockade in eastern Ukraine threaten to block all coal imports from Russia. KIEV (Sputnik) — The organizers of the trade blockade in eastern Ukraine said Friday that they would block all coal imports from Russia beginning from April 2 in case Kiev failed to reach agreements on coal shipments from other countries by that time. “We give the government time by April 2 to sign the contracts on coal supplies with countries which do not conduct warfare against Ukraine. We give the government time by April 2 to reconsider its trade policy with the aggressor country of Russia,” the blockade’s main organizer, Anatoliy Vynohrodsky, told reporters. He added that beginning from April 2 the observation stations of the blockade organizers, which are to be established along all the railway transition posts, will begin the blockade’s active phase. “First of all we will not let coal from Russia pass,” Vynohrodsky pointed out. Vynohrodsky noted that concerning other supplies from Russia, the blockade organizers would “consult with the Ukrainian people.”In late January, a group of former participants of Ukraine’s military operation in Donbas, including several lawmakers, blocked traffic on several segments of freight rail lines running from the territories uncontrolled by Kiev. The blockade led to irregularities in supplies of anthracite coal from Donbass, leading to power shortages in Ukraine and prompting Kiev to declare an energy emergency. 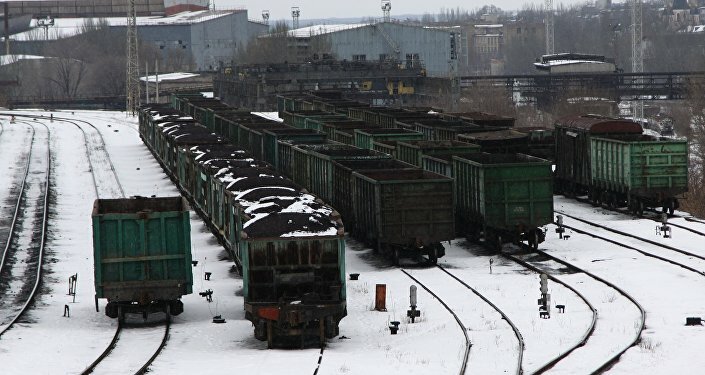 Kiev’s authorities criticized the actions of the blockade organizers saying that coal shipments from Donbass were legal as coal producing plants located there had been paying taxes to the Ukrainian State Treasury Service. However, no efforts have been undertaken by the Kiev authorities to lift the blockage. In January 2015, the Ukrainian parliament adopted a statement designating Russia as an aggressor country, as Kiev considered Russia being a party to the military conflict in Donbass. No evidence supporting this statement was provided. Moscow denounced the statement. Russia repeatedly said it was not part to the Ukrainian conflict, had not provided military equipment to Donbass militia and was interested in the settlement of the Ukrainian crisis.